Visitors arrive in droves to check out New Zealand’s hottest destination, filling the tour buses and queueing at the wide range of paid geothermal attractions. However, what many people do not realise is that there are more than enough free geothermal wonders to fill your weekend. Here at Real Rotorua we have put together a list of some of our favourite free hot-spots. This public park is filled with an abundance of mud pools, boiling lakes and geothermic wonders. Don’t miss Lake Kuirau at the Northern end of the park, with a walkway across the steaming waters, colourful algae and some prehistoric geothermal clubmoss. As always, it is advisable to stay on the cool side of the safety fences, but if you are desperate to dip your toes there are relaxing foot baths in the centre of park. 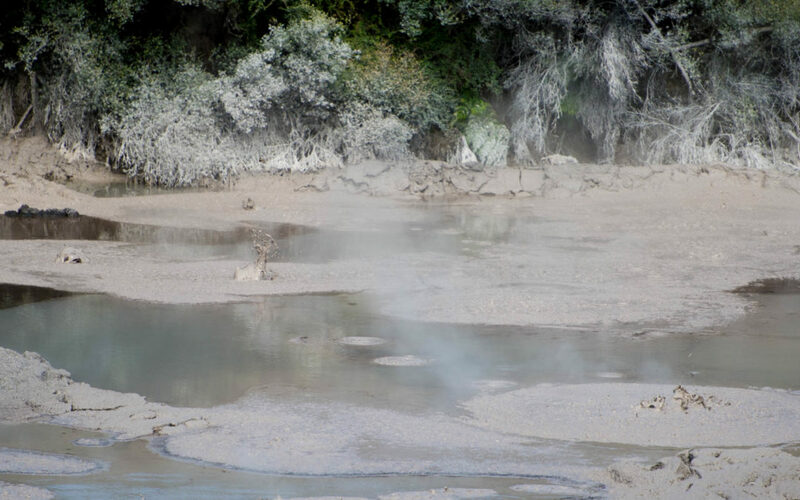 Rotorua’s very own moonscape is a great place to take a stroll and explore bubbling mudpools and Sulphur vents. For the geologically curious there are interpretation panels along the trail providing information on the formation of the area, as well as the various plant and animal species you are likely to encounter. The water in the bay is very murky due to Sulphur suspension, and with a PH of 3.5 it is not advisable to dip your toes in this area. If you need further proof, have a close look at the birds of Sulphur Point, which are often seen with the webs of their feet eaten away by the acidic waters. On the Waiotapu Loop road you can find the largest display of bubbling mud in the area. Activity is guaranteed as the steam and gases rise through the pool to create luscious muddy bubbles. The hypnotic effect of the bubbles forming and bursting might keep you entertained for hours, if it wasn’t for the smell that comes with it. and is well worth the $2 coin donation. Plus a photo of the stained-glass Jesus who appears to be walking on the lake is a must-have holiday snapshot. Be sure to delve even deeper and take a stroll through the local streets to see how the geothermal energy is used for cooking, bathing and heating in the nearby homes.